The screw-in temperature sensors with integrated transmitter can be used with the plug-on display model AUF... as economical digital thermometers with analogue output (4-20 mA). The plug-on display is available with limit contact as an option. 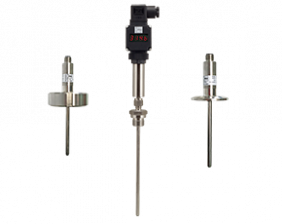 The model MMA-... temperature probe connections are made of stainless steel available in G¼, G½, ½" NPT, clamp DIN 32676, VARIVENT® or Union Nut DIN 11851. The bulbs have been designed for pressures up to 36 bar, depending on the process conditions. Due to a DIN 43650 connector the transmitter can be cable-connected or retrofitted with the plug-on display very easily. The M12 connector has the same cable-connection properties. The temperature sensor is equipped with an extension neck for process temperatures >150 °C. The Pt100 temperature sensor is conform to IEC 751, class A, 1/3 DIN, 1/10 DIN or cryogenic (for further information see order details).